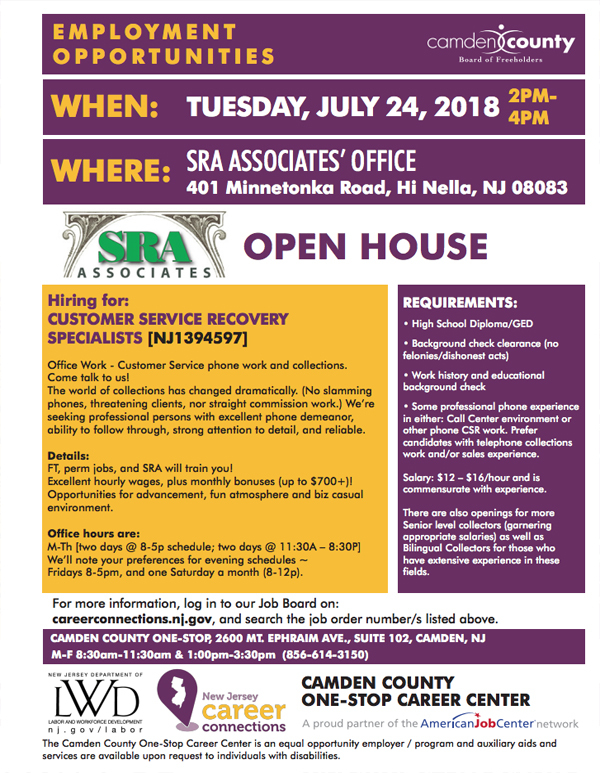 SRA Associates will be holding a Recruitment on Tuesday, July 24th, 2018 at the SRA Associates’ office, 401 Minnetonka Road, Hi Nella, NJ 08083. ALL candidates MUST be prescreened and scheduled for an appointment prior to the recruitment date by their Local One-Stop Office. Visit your local One-Stop Office NO LATER THAN July 23rd to be prescreened and to schedule an appointment. One-Stop Hours are Monday through Friday, 8:30 AM to 11:30 AM and 1 PM to 3:30 PM.